Autumn has poked her nose in here at Hahndorf Hill, and this last month or so, Larry and I have often remarked upon how much warmer and drier things are this year. A student of the classics will recognise the turning of the leaves and cooler nights to be the first signs that the Goddess Demeter has begun to neglect her duties and instead, mourn the annual loss of her daughter Persephone as she once again prepares to resume her place at Hades side on the throne of the Underworld. That being said, this need not be a gloomy time; there are delights to be found in an early evening, particularly for those with a sweet tooth. 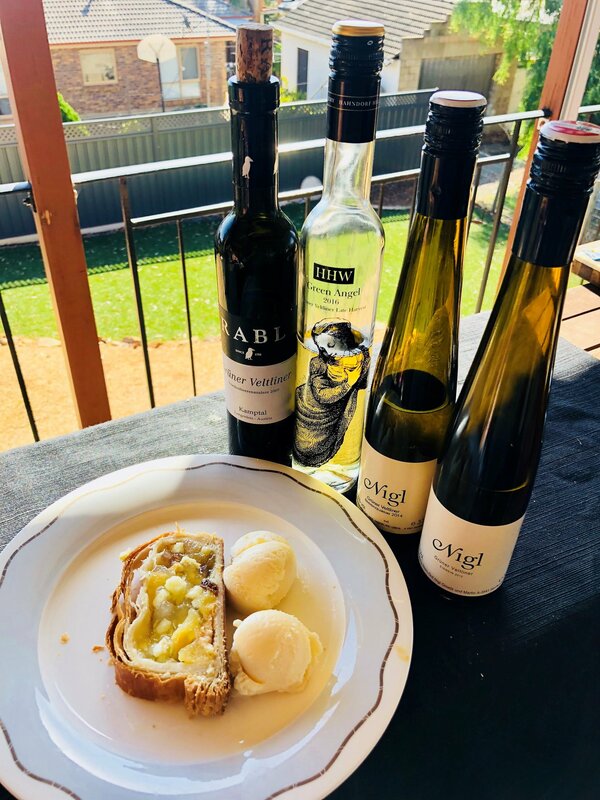 Sweet or dessert style wines have been sealing off a meal for centuries and with the first recorded example dated to 1526, it was once again the Austrians in the vanguard of wine evolution. The area around Lake Neusiedl in the region of Burgenland served as the crucible for dessert wines almost 100 years before the first Sauternes stickies and over 200 years before the first fortified Ports. 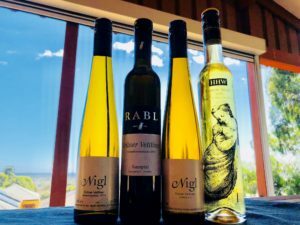 The Austrian wine industry is heavily regulated, and the dessert wine category is no exception. Unlike most sweet wine producing countries, the areas which once made up the Austro-Hungarian empire work to a unique system where the category your wine falls into depends on the sugar level of the fruit at the time of picking, rather than the residual sugar of the finished wine. Spatlese: Fully ripe fruit with a minimum Baume of 12.4 degrees. Auslese: Fully ripe, carefully selected fruit with a minimum Baume of 13.7 degrees. Beerenauslese “Selected Berries”: Overripe fruit, this is the first tier affected by the Botrytis mould or “Noble Rot”. Minimum Baume 16.3 degrees. Ausbruch: Overripe fruit that has naturally shrivelled and been affected by Noble Rot; a wine may only be labelled Ausbruch if it has come from the town of Rust. Minimum Baume 17.6 degrees. Trockenbeerenauslese “Dry Selected Berries”: Overripe fruit, naturally shrivelled and affected by Noble Rot. Minimum Baume 19.6 degrees. Eiswein: These wines are made from grapes left on the vine until the frosts arrive. They must be picked at night to ensure that the temperature remains below freezing while the grapes are harvested and pressed. As the water in the grapes is frozen only the most concentrated flavours comes out. Now that is out of the way, let’s have a look at some wine! Nigl is a producer based in the village of Senftenberg in Kremstal, a region made famous by Gruner Veltliner and Riesling. Their terraced vineyards stretch along the valley to the limits of the local capital Krems and consist of very rocky soils which give the wines of Nigl their signature minerality and spice. Handcrafted wines made to the highest standards are what you will find here, with a focus on finesse and elegance. 90% of Nigl’s production is white wine with Gruner Veltliner leading the way. Their 2014 Beerenauslese is intense yet sophisticated; yellow fruits and honeyed, dark toasted bread greet you at the door then guide you to a comfy chair of earthy, roasted nuts. The 2012 Eiswein is tighter and lighter than most of its compatriots. Tropical notes of passionfruit and pineapple lead a band featuring the finest honeycomb, pepper spice and apple. It was the acid that most surprised me about this wine, in a good way. Not nearly as treacly sweet as other examples. This time last year I was in Austria and very much looking forward to visiting a producer I have admired for a long time in the region of Kamptal. 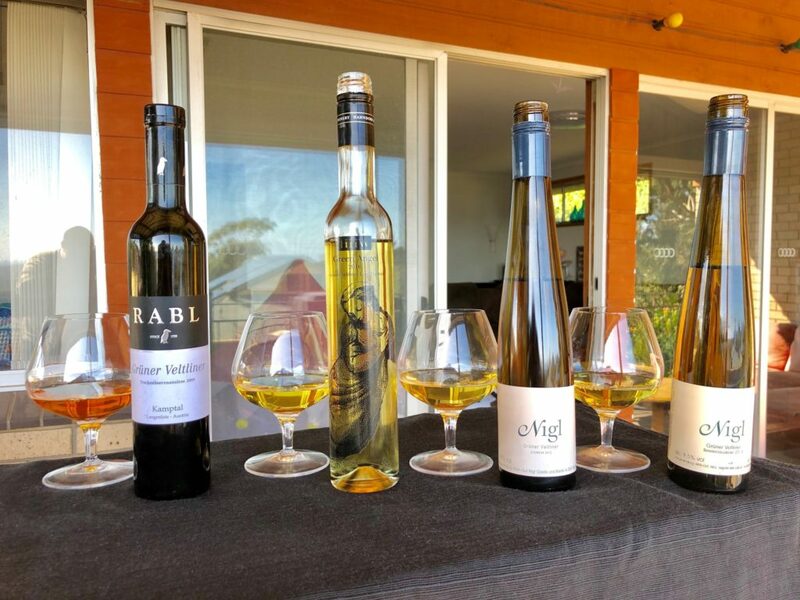 Since 1750 Weingut Rabl has been making wines specifically designed to be drunk for fun, and while this may sound a little glib, I can tell you from first hand experience they mean it because they live it. Their fruit is picked from some of the most prestigious vineyards in Austria and you can tell from the second the wine hits the glass. I have written previously of their steely, peppery dry whites but this article is all about stickies so let’s take a look at their 2009 Trockenbeerenauslese. This wine is Gruner Veltliner with the Caps Lock on! The nose is intense but clean. Honeyed stone fruit and spice dance across the palate like a double helix coursing through a vein. The finish is long with roasted, nutty notes. It would be easy to lose all finesse and structure in a wine this sweet but Gruner’s signature acid has kept this wine in check like the firm but steady voice of a wizened old cowboy calming a young horse. These are not everyday wines so let’s get some perspective from something more familiar. For years now we have been saying Hahndorf Hill is a house of spice-driven, dry wines; well now we need to add a little asterix to that. 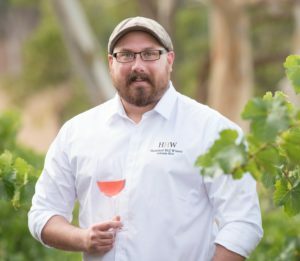 Like 2018, the autumn of 2016 was long, mild and dry; these conditions provided us with the perfect opportunity to try our hand at a new style and reaffirm our commitment to staying at the cutting edge of Australian Gruner Veltliner. From our inception we have made a commitment to stay true to the wine styles and structures pioneered by the Austrians whilst always embracing and respecting our own terroir. This means we don’t always fit into the strict Austrian classification system but our priority has always been to make the very best wine we can for you, our customers. This attitude is no more apparent than in our 2016 ‘Green Angel’ Late Harvest Gruner Veltliner. With a picking Baume of 18 degrees and a residual sugar of 170gms, we are at the drier end of the spectrum, and as the name suggests it is a “Late Harvest” not a Botrytis affected wine. In short, this is the driest member of a sweet family (not unlike myself!). Lemon zest and poached pear leap from the rim well before the glass itself can even make it to the same postcode as your mouth. The wine glides down the palate showing off with notes of fresh citrus, custard apple and subtle, peppery spice. I made a point of inviting some friends over to enjoy these wines with me and paired up some dishes the textbooks will say work, but as is my custom, I snuck in a few pairings designed to provoke and titillate. Crumbly blue cheese and Austria’s signature apple strudel were a delight, but so too were the Black Pig Iberico Jamon and pickled jalapenos. I suppose the moral of the story is these are wines made with fun in mind, and this need not be a time to lament the loss of the warm summer days. 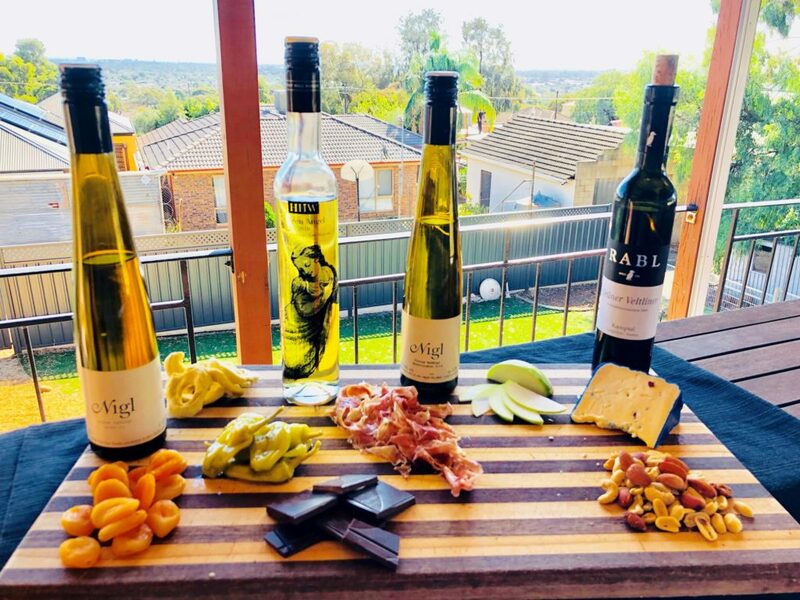 Follow this link https://www.hahndorfhillwinery.com.au/Buy-Online to order your own ‘Green Angel’, invite the friends that you can rely on for good conversation and embrace the slip into winter. 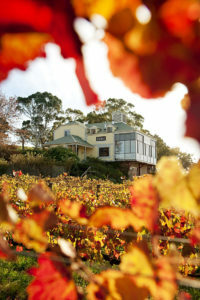 This entry was posted in Adelaide Hills, Adelaide Hills best Cellar door, Adelaide Hills Gruner Veltliner, Adelaide Hills wine, Adelaide Hills wine region, Blaufrankisch, cool climate wine, dessert wine Aelaide Hills, Diurnal variation temperature, Gruner Veltliner, Gruner Veltliner Australia, Hahndorf, St Laurent, sticky wine Adelaide Hills, Uncategorized and tagged Adeaide Hills cellar door, Adelaide Hills, Adelaide Hills wine, Adelaide Hills winery, Blaufrankisch, cool climate wines, Dessert wine Adelaide Hills, Dessert wine Gruner Veltliner, Diurnal variation temperature grapes, Gru, Gruner Veltliner, New Planting, Sticky wine Adelaide Hills, Zweigelt Australia. Bookmark the permalink.